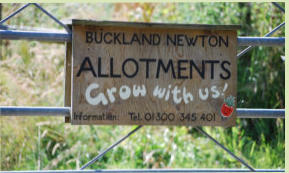 Allotments are available from £20; it is not just about growing vegetables - people can grow fruit trees, soft fruit, flower arranging flowers or wild flowers. We are a friendly bunch of people, and even if your crops don't grow you are bound to find some companionship! There are several plots available which have been under cultivation for several years. The ground is nice to dig and well manured. If anyone would like to take a plot 8 x 8 or 8 x 16 sq. metres, please contact John Simpson on 01300 345401.